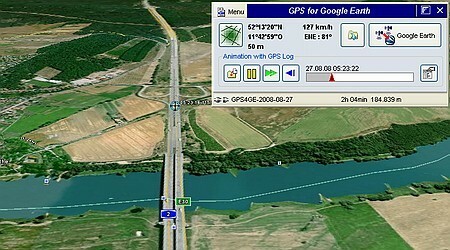 "GPS for Google Earth" converts the free Google Earth version into a GPS Navigation for Laptop or Netbook. The own GPS-position it shown and tracked in real time in "Google Earth". Also by night, with fog or mist you'll see your current movement like on a bright day on the screen. Each tour is automatically recorded. In addition one may play animations of formerly recorded GPS logs. 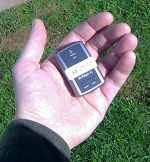 In addition one needs only a little GPS receiver. There's no need to bye a full navigational system. A so called GPS mouse or a GPS USB dongle are available in low cost level. The connection may be established by cable, USB or Bluetooth. The software itself is'nt restricted to a special manufacturer. The program works with each GPS Receiver that provides NMEA. But this is the case for all commercially available receivers. The program is'nt retricted to only one country. The GPS coverage is world wide. Even in fare-away places you'll find a way there and back. The problem of the absent internet may be avoided by a little trick (see: without internet).